Forget Mad Men modernism. This season's style is all about Downton Abbey's Edwardian opulence. Millions around the world have been seduced by the straight-laced but stylish world of the British historical drama. Soon they'll be able to take some of that style home, getting lips as soft as Lady Mary's, wine inspired by Lord Grantham's favourite tipple ? and even walls as grey as Mrs Patmore's kitchen. The programme's makers have arguably been slow to exploit the commercial potential of that popularity through merchandising, selling little more than DVD sets, wall calendars and desk diaries. But that’s about to change. Along with the fourth season starting on British TV next month, comes a range of merchandise that includes a board game, homeware, clothes, beauty products and even Downton wine. "We haven't rushed into it," executive producer Gareth Neame told Associated Press this week. "We don't want to carpet bomb the retail sector." In keeping with the show's posh-frothy image, the products being rolled out aim to be quirky rather than kitsch. British retail chain Marks & Spencer will be selling a Downton Abbey beauty line, including soap, nail polish, lip gloss, lotion and scented candles. The items are whimsically packaged and adorned with quotations from the series, including the advice offered by Maggie Smith's Dowager Countess of Grantham in the first episode, "No one wants to kiss a girl in black." Downton merchandising in the US and Canada is handled by Knockout Licensing, which has struck deals for a jewellery range from Danbury Mint and Downton-themed Christmas ornaments from Kurt Adler ? both going on sale later this year. It also has a licensing agreement with figurine manufacturer Bradford Exchange, raising fans' hopes for a range of Downton dolls ? Scheming Thomas and Admirable Bates, perhaps. North American fans also can soon drink Downton Abbey wine, marketed by Wines That Rock, the California company behind Rolling Stones' 40 Licks Merlot and Pink Floyd's Dark Side of the Moon Cabernet Sauvignon. The Downton red is a genteel departure for the firm, a French claret reminiscent of those favoured by the early 20th-century British aristocracy. 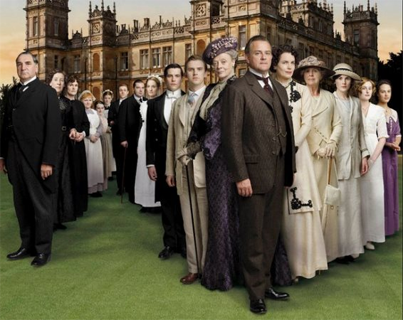 Cele Otnes, a professor of marketing at the University of Illinois at Urbana-Champaign, says the richly detailed world of Downton Abbey is key to viewers' intense bond with the show. She likens it to Mad Men ? "It's not just a television programme, it's really an aesthetic" ? and cites reported rises in sales of cravats, waistcoats and sherry as evidence of a Downton-driven appetite for Edwardian elegance. And no detail is too small for emulation ? down to the paint on the abbey walls. Mylands, the London-based paint company that supplies the show with historically accurate pigments, recently began marketing two of its Downton tones to the public ? Amber Grey, the colour of the downstairs kitchen overseen by cook Mrs Patmore, and Empire Grey, which adorns Mr Carson's butler's pantry.